the weekend's cycle racing coverage ended with quickstep innergetic's nick nuyens winning kuurne-brussels-kuurne on sunday. 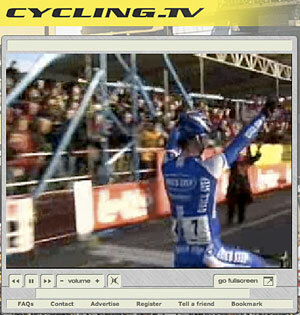 all live coverage on cycling.tv. it's why they invented broadband. for only £19.99 you can subscribe to the premium channel and help get more coverage. you know it makes sense. i may well have mentioned, on more than one occasion, that islay is windy. sometimes it's very windy, and sometimes, like today, it's not too windy. but even when it's not very windy, it's probably windier than most of the uk and i don't really notice because i'm almost used to it. i've lived over here for more than eighteen years, and i've been cycling all that time. in fact, i lived here almost eight years before i owned a motor car (it has its uses), and the wind has been here all that time. folks over here on cycling holidays frequently comment on the seemingly perennial wind, and somebody last year actually asked me if i went out cycling when it was windy. if i didn't, there wouldn't be a washingmachinepost! so having road tested a pair of assos airprotect bib tights only a couple of episodes ago, which had very favourable effects on the 'easter knees' syndrome, it seemed only right that i test the assos equivalent for the upper body. i have owned an assos roubaix jacket for about the last three or four years, and while it is warm and cosy, it is not particularly windproof. to fight off the wind, an assos showerproof jacket over the roubaix works a treat, but it doesn't really let the wind back out again, so unless it's wet and windy, you cook. enter the assos airjack 851. as with all assos gear, it's reassuringly expensive (around £150 in the uk) and a quality bit of kit. the airjack is constructed from a very simlar flavour of roubaix material as my long serving other jacket, but what makes this one different is a liberal coating of airprotec material on the shoulders, the upper chest area and the front of the arms. airprotec has the appearance of a perforated textile with a white fabric visible through the perforations. the old airblock jacket (the airjack's predecessor) was always remarkable for having a solid black area across the chest, because apparently it was not practical to colour airblock to match the colour of the rest of the jacket. and assos are nothing if not colourful. however, it appears that colouring the airprotec material presents no problem (see photo at top of the page) since my yellow version of the jacket is just as bright and shiny on the front as it is on the back (where there is nary a trace of airprotec). the shoulders and neck are coloured black in all models. but it is this lack of airprotec at the back of the arms and on the back of the jacket that stops this jacket from becoming too hot, because believe me, this stuff works unbelievably well. there are the usual three (surprisingly large) rear pockets along with a smaller zipped pocket on the outer part of the right rear pocket where i can put the money i need for an espresso and a piece of carrot cake at the croft kitchen when it opens mid march. to give an example of just how much you can stuff into these pockets, i carried a mini pump, spare inner tube, cool tool and a rather ageing digital camera, produced before it become practical to make them the thickness of credit cards. and i could have carried the same amount again before the pockets would start to look full. additionally there is a scotchlite type reflective strip down the middle of the pockets just to alert any following vehicles as to your presence ahead. so, even if you don't do most of your cycling in the inner or outer hebrides, assos' airprotec material can help you stay cosy when it's cold and windy. if it were at all possible, they could put a little sew-in on the seam saying 'tested on islay'. 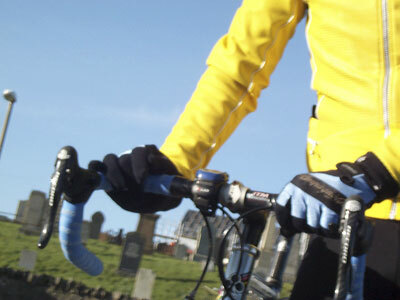 if you're in the market for new cycling jacket, this is the one to go for. and it will last for years, providing a very favourable roi (return on investment). this column appears, as regular as clockwork on this website every two weeks. (ok so i lied) sometimes there are bits added in between times, but it all adds to the excitement.